PALO ALTO, Calif., Aug. 22, 2011-- HP today expanded its Elite business desktop portfolio with the industry’s first all-in-one PC that integrates the power of Intel® second-generation Core™ vPro technology to deliver up to 40 percent better performance, 15 percent faster hard drive access and reduced downtime via remote IT management. Ideal for enterprise, midmarket and public sector customers, the sleek, space-saving HP Compaq 8200 Elite All-in-One Business Desktop offers robust performance, enterprise security and remote management features, as well as integrated collaboration tools that allow businesses to connect to coworkers at the office, across town or on the other side of the globe. Featuring an expansive 23-inch diagonal full high-definition LED monitor, the HP Compaq 8200 Elite All-in-One includes an integrated webcam, microphone and speakers for streamlined remote face-to-face communication. SRS Premium Sound is included to deliver a refined audio experience complete with immersive surround sound. It also comes with a one-year HP Virtual Rooms license, allowing businesses to conduct presentations, team meetings, training events and classes in an easy-to-use online conference center. The HP Compaq 8200 Elite All-in-One comes with a standard three-year warranty for parts, labor and next-day, on-site service. It delivers premium customer support through HP Total Care and HP Care Pack Services , and offers extended service contracts that go beyond standard warranties to help maximize return on investment. Customers also can rely on the recently introduced HP Elite Premium Support, which employs a dedicated staff of Elite-accredited technical professionals to provide fast and in-depth problem resolution for the HP Elite family of products. The first all-in-one addition to the HP Compaq 8200 Elite Desktop Series , the HP Compaq 8200 Elite All-in-One supports the latest Intel processors and Intel Q67 Express chipset to intelligently maximize computing performance. It also utilizes Intel Turbo Boost Technology 2.0 and Intel Hyper-Threading Technology to improve integrated graphics multitasking. Easy to deploy and manage, the new HP Compaq 8200 Elite All-in-One is equipped with Intel Standard Manageability and HP BIOS features, as well as Intel vPro technology to enable remote PC management and issue resolution. The HP Compaq 8200 Elite All-in-One also features an array of advanced HP Elite-class security tools to help protect critical business data, including a standard embedded TPM 1.2 compliant security chip for hardware-based encryption, as well as increased personal encryption through HP’s full suite of HP ProtectTools, including HP DriveLock, HP Digitalpass and HP Face Recognition. For enterprise customers looking for maximum configurability, data storage and file sharing flexibility, the HP Compaq 8200 Elite All-in-One supports up to 8 GB of DDR3 SDRAM PC3-1333 system memory and includes two memory slots, a mini PCI Express (PCIe) slot and a drive bay. It also offers expanded Solid State Drive (SSD) capacity options for faster data access, quieter and cooler operation, and greater durability than standard hard drives. 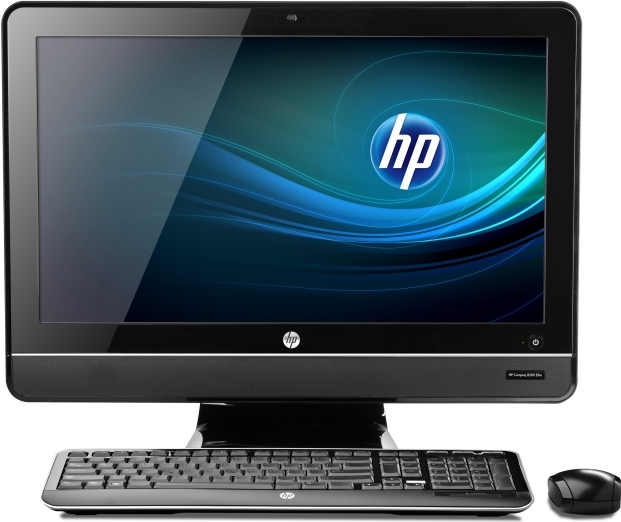 The HP Compaq 8200 Elite All-in-One is ENERGY STAR® qualified and EPEAT® Silver registered and offers an 89 percent efficient power supply. It also comes preinstalled with HP Power Assistant, is enabled with S3 sleep settings mode and features a holistic thermal design with temperature sensors, fan acceleration and power management settings. The HP Compaq 8200 Elite All-in-One Business PC starts at $999 and is available now in the United States. HP also recently announced that the HP TouchSmart 9300 Elite is now qualified under the Microsoft® Compatible Devices Program , supporting versions of Office Communications Server R2 and Lync Server 2010. Additional information is available at http://technet.microsoft.com/lyncdevices.